Do you love crepes but always found it difficult to prepare? Do you often end up with undercooked crepe when you use a pan? If so, I suggest you get a crepe maker for your kitchen. A crepe maker is a kitchen appliance that’s a more practical solution to say, making crepe in a skillet. You’d be surprised to learn that a crepe maker is cheap. The prices have steadily gone down thanks to the many brands coming up with different crepe maker models. Plus, a crepe maker is also versatile as it can also be used in preparing pancakes and tortillas. What to look for in a crepe maker? But because there are numerous models available doesn’t mean that you just get the first unit that you come across with. In shopping for a crepe maker, you’ll have to choose between gas and electric models. It’s really up to you which one you prefer but wouldn’t you want to learn the pros and cons of each type? 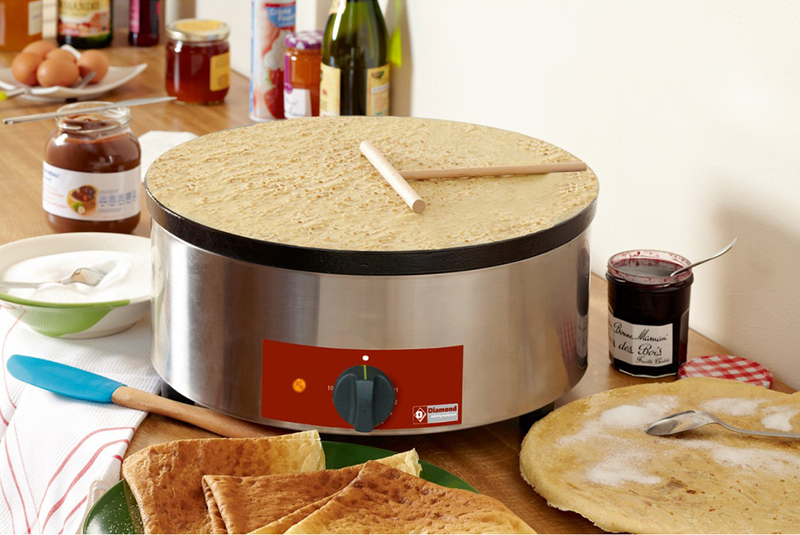 Electric crepe makers are known for being energy efficient. They are also portable because you simply plug them into a wall outlet, unlike a gas unit which requires the gas line or liquid propane. Gas-powered crepe maker, though, can save you more time because it heats up faster than an electric crepe maker. You will also have to choose between a single and dual crepe maker. Your decision would be based on the volume of crepes you intend to produce as well as the space you have in the kitchen. If you live alone or with a small family, a single unit should be enough. It is not only cheaper but also saves counter space. Speaking of space, you ought to get the dimensions of the crepe maker and decide if it would fit the space you have in the kitchen. Crepe makers for home use usually feature a 12 to 13-inch griddle plate. Commercial units, on the other hand, have at least a 15-inch griddle plate. The material from which the crepe maker is made from may also affect your buying decision. Stainless steel is a very good material as it is durable and easy to clean. A good crepe maker machine also heats up quickly and evenly. This should help you save time aside from having well-cooked crepes. Just like in selecting a rice cooker or even a blender, you’d want to look at the dimensions of the crepe maker machine and determine if you have space in the kitchen for it. Finally, the accessories included in the crepe maker may not be considered a deal breaker but who don’t want to get freebies, right? Some models come with the specialized spatula that can be used in turning, folding and serving the crepe. Others have tongs, scraper, cleaning brush and measuring spoon included in the package. I’m listing five crepe makers ideal for homemakers like you--- so don’t expect one with a 15-inch cooking surface. These crepe makers are also compact and space-saving. The name may suggest otherwise, but this is really a crepe maker for home use. Its 12-inch non-stick surface is perfect for making quick and delicate crepes. It has five different temperature settings allowing you to adjust the temperature and get perfect crepes. This is a crepe maker that’s easy to operate. The on/off ready light will tell you when the plate is hot enough. Clean-up is a breeze as well. Simply wipe off the crepe pan with a damp paper towel. The rubber feet of the crepe maker add stability to the unit. You’ll get a recipe book when you buy this unit. The package includes a batter spreader which you can use in making super thin crepes. This crepe maker measures 14 inches long, 4.2 inches wide and 15.8 inches deep. It’s designed for small kitchens. This unit from CucinaPro measures 15 inches long and 7.5 inches wide. A recipe booklet comes along with the unit aside from a dipping plate, and batter spreader. This crepe maker has an on/off switch that lights up once the surface is warm enough for cooking. You’ll love that this is a cordless crepe maker which would let you maneuver the skillet part without a cord getting in the way. Plus, it can heat up very quickly so making crepes should be a breeze with this unit. You will also find the shallow dish included in the package to be very helpful in getting the appropriate thinness of the crepe. While not as compact as the two items preceding it, this electric crepe maker from NutriChef still gets a lot of positive reviews online because of its other characteristics. One thing I liked about this crepe maker is that it is smartly designed. I believe even the older ones will not feel intimidated with this crepe maker. There’s the temperature control which you can adjust with a simple turn of a knob. It may appear too old for some, but I find it very simple and basic. There’s also a light indicator for power and temperature changes. As I’ve mentioned, this one isn’t the smallest crepe maker you’ll come across with. It measures 12 inches long, 12.9 inches wide and 2.4 inches deep. Despite that, you will appreciate the lightweight nature of this crepe maker. It only weighs less than 3 pounds so moving it around should not be an issue. This has almost the same size as the NutriChef crepe maker. It measures 12.8 x 12.8 x 2.5 inches. It is slightly heavier though at 5 pounds. The package includes an oil brush, wooden spatula, batter spreader and ladle. Similar to the NutriChef unit, it has a simple temperature dial that you can use in adjusting the temperature. The non-stick cooking surface is easy to clean. You only have to wipe it with a damp cloth. The nearly 13-inch wide surface gives this crepe maker enough space for another food to be cooked. 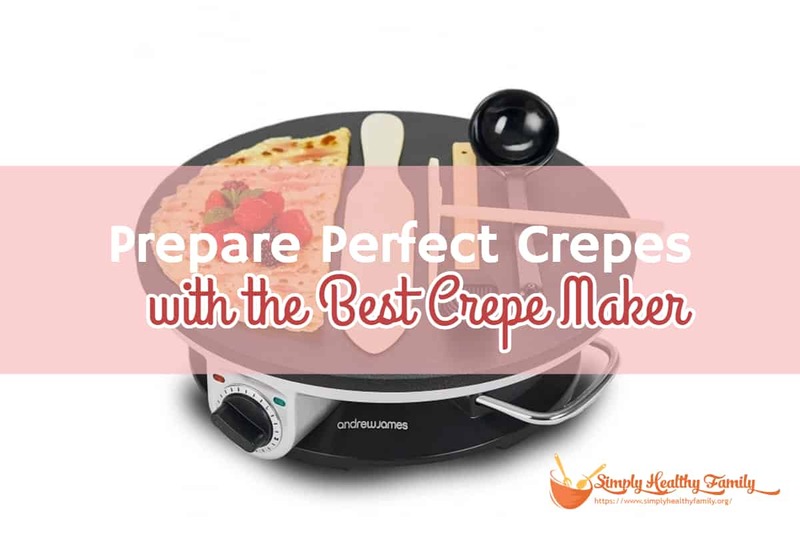 While many owners say there’s a slight learning curve required, they agree that this one is still very ideal for people who aren’t used to operating a crepe maker. This crepe maker with a 12-inch diameter also works as a griddle allowing you to cook different breakfast foods like bacon, eggs, and pancakes. Of course, you’ll buy this with the intention of cooking crepes. You’ll benefit from the precise temperature control of this unit. The built-in light indicator will tell you that the electric plate is hot enough for making crepes. And it will shut off once the unit reaches the desired cooking temperature. You will also appreciate how compact and lightweight this crepe maker machine is. It is about 12 inches long and 2.8 inches deep. It’s a space-saving appliance that is also quite portable as it weighs just less than 3 pounds. Also included in the package are a wooden spatula, a batter spreader, and a 100-recipe e-cookbook. I have no doubt that you will like any of these crepe makers. But if you are to ask me which of these crepe makers is the best, I would have to say it’s the G&M Kitchen crepe maker. I believe it has the best combination of size, function, and accessories for any homemaker. The inclusion of a recipe book is a nice bonus, too. What about you? What do you think is the crepe maker that gives the best value for your money? Let me hear your thoughts by writing in the comments section below.